It has been quite dreary here in North Carolina where I am. We have had quite a bit of rain and more grey skies this summer than I can ever remember having before. In this gloom I have sought something to brighten it a bit, and what better to lighten the mood than a story of love uncomplicated by monsters? To this end I have been reading Miss Darcy Falls in Love by Sharon Lathan. 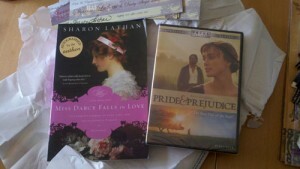 You may remember that it was part of the prize pack I won that also included the 2005 version of movie Pride and Prejudice, which I talked about previously. The thing that struck me the most in this wonderful tale was the sweetness. Not a sickening sweetness that makes one gag, but the perfect sweetness with hints of bitter as the course of true love, as it is said, never does run smoothly. Or perhaps I was in the perfect mood for the sweetness that might otherwise put me off. My reading moods vacillate, from kill-it-with-impunity to drown-me-in-love, with occasional bouts of make-a-mockery-of-it-all. This is the story of Georgiana Darcy discovering love and a deeper appreciation for her talent in music while on holiday in France. For anyone with a love of music or who has ever taken a music appreciation class, there are many musical references and descriptions that will make more sense than if you are completely unfamiliar with musical terminology. I kind of wish this book came with a musical score due to the mentions of the various songs and compositions created by the characters that add richness to the story as it unfolds. As with any novel set in the Austen world, there are issues of etiquette and decorum that must be navigated by the characters with some prejudices among class distinction. This is made more intriguing when there is a rivalry between two gentlemen for Georgiana’s affections. It is fascinating to see how they manage self-control and civility when emotions are intense. I found myself becoming anxious for the characters and becoming engrossed in the book the more I read. Even though I knew there must be a happy ending to the novel there were moments when the tension worried me as to how things would be resolved. That, of course, is a very good thing to experience when reading because it speaks to the skill of the writer in creating an engaging story. There are no monsters, but the tension is palpable with love and desire, making it worth the read.